Edward DiMaio’s newest poetry collection, Germination Point, is filled with gentle musings, reflections on love and life, brutal acts, tragic loss, and betrayal. Each poem is wrapped in layers of rich imagery, making even the most inexplicable topics penetrable and easier to access. Red moon rises upon a velvet sky./I make my way from love and into love: Full love, thick with passion. Life finishes where desire is confused and muddled by fear./Once willing, now still, life passes from where it is banished without mercy./Broken men leave bits of their brother’s broken body along a dirt road./They show the world what they see deep within their own eyes. Gritty is followed by Ashes of Auschwitz where the author echoes the same questions many of us ask about past atrocities and the current abominations that we’re witnessing in our world today: What will be learned?/What will change? giving the reader the opportunity to cleanse the pallet so they can taste the next delicious morsels that fill the collection. Reading DiMaio’s Germination Point is like hiking an unfamiliar trail where much of the path is flat and easy, interspersed with steep and treacherous climbs that leave your lungs burning and your legs shaky. But like all challenges in life, once you reach the top, the view is priceless. DiMaio’s collection does what all good art should do, it opens the mind and heart just a bit more, allowing much needed light to seep inside where true growth lives. Book Review: Germination Point by Tom Torinus. I am delighted to announce that Thames Davis has joined the editorial process of Germination Point. Tom has written and published non-fiction, fiction, and poetry books and has had articles and essays appear in a number of magazines and academic journals. Tom’s latest book isThe Weirding Storm, a dragon epic. As with my first book, Sound Scent & Light, the editorial process was a great learning opportunity for me. That process continues with Germination Point. Davis’s Suggested spots in need of polish or adjustment in punctuation have help me clearly discern concepts of writing that eluded me in my school years. Being dyslexic greatly effected the level of education I received in the NYC public school system during the 60’s and 70’s. Content was low as were the schools expectations of me was based solely on my spelling abilities. Working with Thomas Davis has continued the expansion of my knowledge of the finer points of the, at times, abstract process of writing in the English language. I am truly excited to be working with such a knowledgeable person in the area of letters. Be sure to check out His epic dragon poem through the link provided. 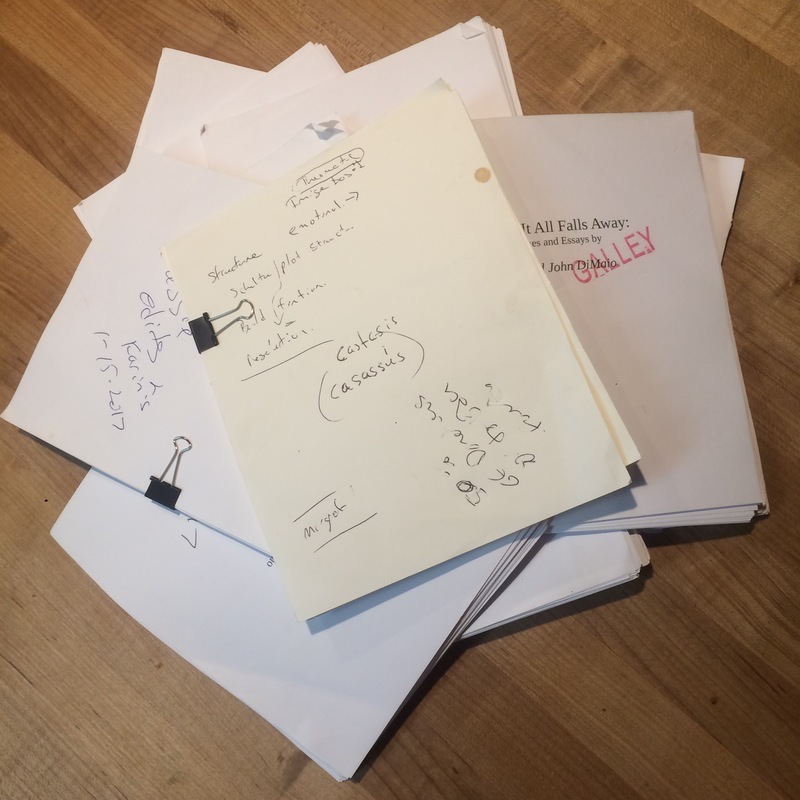 A pile of changes symbolize todays focus on the refinement of the sequence that the poems are gathered in and starting to enter the body of the text into the format favored by the printer. The October release date lurks close as the nights come now with a chill under a moon that wanes along with the heat of summer. Galleys pile up as poems are listened into focus. Cequence is the talk of the day, Entering in the “Printers formatting”is next along with: Cover art, font and page layout choices, editor, Price? Feeling blessed by it all. “This book is an unfolding,” Edward DiMaio states at the beginning of his collection, Sound, Scent, & Light, unaccompanied by punctuation or any other emphasis. DiMaio, a Sturgeon Bay contractor, social worker, and poet writes poetic journal entries and contemplative prose of past traumas and vivid depictions of nature’s presence. From these two forms arise a picture of commitment to self-discovery, as well as realizations about the delicateness of life and harmony. DiMaio’s writing began in a spiral notebook for journaling. He wrote as a means to work through the difficulties and traumas he faced growing up. Eventually, poems emerged in the pages of his notebook, such as his early Strangely I Smiled. of tight quarters, a still relationship. regret drifted up to my bedroom window. Specificity of imagery and a brisk, bare tone give a glimpse of wizened wonder and gentleness toward adolescent fear and uncertainty. This perspective sets the stage for the real work of Sound, Scent, & Light. Just as memories are called up to bear, they are met with tender reflection. awakened, reached up through my fear. come with the light of a new day. DiMaio’s reflection upon harsh experiences in his life – difficult circumstances, the death of loved ones, decisions made in zugzwang – provides him with opportunities to embrace reality and grow. The tedious work of self-discovery shines through their visage of therapy in these journal entries. A decision made on uncertain footing leads to a declaration of dedication to life and its challenges in the confessional, Gone. How wise was this choice? that I best discover my life. Love and loss accentuate life’s turns toward maturity. The love portrayed by DiMaio is young, unsure, and at times a little desperate. His grappling with loss is afraid and blinding, as if the lights in a vast and empty ballroom suddenly burnt out, leaving him stranded. Momentum is gained through these emotional pushes and pulls in life, feeding his hunger and reminding him of what is important. The impulse to reflect upon the difficulties in life spurs on personal growth in the deepest sense. This massaging of tension and dissolving of inertia enables us to move with the waves of life, rather than reel at every shift. Through the work of opening and healing these old wounds emerges a picture of a grounded, motivated, and compassionate man. The dynamic image of DiMaio’s coming-of-age is set upon a vivid backdrop of stillness in songs of nature. Beauty, love and awe evolve from savoring the present moment and tasting the spectacle of nature in great detail. Often trees speak of seasons, their roots preventing them from following the birds departing for winter, their new spring foliage welcoming back those same birds who return to sing away the frost. The waters of the Atlantic Ocean pull DiMaio toward thoughts of unity and a vast formlessness. DiMaio’s crystallizations of nature’s beauty bely a grounding power, a source of energy for his reflections. His descriptions of nature sanctify the present, as in Winds from Around the World. grains of sand out from under me. A stillness seeps through DiMaio’s imagery. His perspective is strengthened and rooted down by the continual motions of the natural world. How long have these grains of sand been on this beach? From what mountain across this great body of water did they erode, carried here to be stood upon by this human? And where did this wind begin? Was this air breathed by a far-away likeness of myself and exhaled in my direction? As these wonderings flow through our heads, we are drawn further into DiMaio’s perspective. We stand with our feet on the same sand as his. Looking forward, however, a more sobering image appears. Presence within nature turns into fear of the future. that quietly departed a visceral assault. we press lead to the lips of our newborns? Human’s presence in nature has put the safety of our world at stake. Though his imagery portrays catastrophe, DiMaio assures that it will be a slow reckoning by our own hands that puts us in the most danger. With this beauty in danger, the solid ground upon which peace lies begins to shift. This jeopardization, above childhood trauma and winters of the soul, demands attention, for it is not certain that will follow. As the countryside approaches, the stale air of the city is blown away by the sweet scent of honeysuckle. DiMaio’s ambivalence about urban life gives way to excitement. My journey ended at Ronkonkoma. old diesel still in motion, I felt renewed. The piece continues with a second trip through the city, some time after the first. The tone this time is less vibrant. “On a more recent trip,” it begins, “the train ride was / quick and quiet.” His expectation for the countryside and its trees and its honeysuckle is met with a grim discovery that had loomed before. Countryside had acquired a new station and a gigantic parking lot filled with cars. “I grieved for this island’s fading beauty,” he laments. This is the supreme dilemma faced by DiMaio in Sound, Scent, & Light. The greatest crisis is that we are doing away with the land, which is the very thing that feeds us, brings us peace when we despair, and provides shelter from the rest of our lives when we need it most. Bit by bit we auction off parcels of land, but what happens when all of the land has been built upon? What happens when the reason is swallowed up by our desire to have it for ourselves? How much can we fill open spaces with our presence before they lose their vastness? from our lives, like water from a cup. existence, I turn to drink contentment. We must choose a different future than this. Rather than individual obligation, it is a collective one. Our consumption has run amok; we are stealing our own souls from our chests by seeking to fill a leaky cup. The leaden goblet of our times is our disregard for the sanctity of nature, of the mother from which we all came– of the choices that we have made to prioritize economic gain over conservation. “This book is an unfolding,” in the sense that it captures the ongoing work of an individual working to find peace and to preserve beauty in his world. Discoveries of self and creeds to live by galvanize DiMaio’s character and draw the elements of this collection together into a coherent whole. Ed DiMaio lives in Sturgeon Bay, WI. He is currently working on his second publication,When It All Falls Away.